When the woman (let’s call her Jo) came to us Monday morning, her computer wasn’t booting up and instead, was giving some strange message about a hard drive security passcode. Mr Chief had a suspicion, so he pulled the hard drive out and tried plugging it in as an external drive. When he went to power it on, instead of coming up on the computer, the drive just made a loud clunking sort of noise. It was one familiar to us, and we knew it meant the drive was dead. Data recovery was pretty much off the table. However Jo’s response to this was something along the lines of “Oh Nooooooooo, but I haven’t been backing up!”. Now, at this point, this is about the last thing you want to hear. Especially since people seem to have a habit of blaming you for their sudden loss of data. Lucky, that didn’t happen for at least a little while . First, Jo went into what can only be described as a sort of grieving for her data. Her face got long and her breathing got heavy. I think she even started to tear up a bit. Mr Chief led her away, to comfort her while the Professor and I tried some less orthodox methods. We only had two: whacking the drive really hard and freezing it. The idea with whacking the drive is that, if the head is stuck in a position it can’t get out of, by banging it on the table, parallel to the direction the arm is suppose to move, you may be able to dislodge it, and it will start working again. Although I make it sound good, it’s not a method I’d say is suggested or condoned. Of course, you wouldn’t trust it after that, but it might be enough to get the data off, at least. Unfortunately this made absolutely no difference, so we had to move on to the next method. Putting a hard drive in the freezer was a method I hadn’t heard of before, but the Professor assured me he had been taught it by Mr Chief, and it had worked before. So he wrapped the drive up in paper towel to avoid letting any moisture into it, and stuck it in the closest freezer for 10 to 20 minutes. He said that’s as long as it could take, and that any longer could damage the drive. However, from what I’ve read (on the net) since, it should have been sealed much better than that, and it should have been in there much longer than that. Regardless, we gave it another go after 20 minutes, and it didn’t work, but after trying again after another ~20 minutes, it lasted just long enough to show up on the computer, and then disappear. So, we declared it officially dead, and went to the break the news. When I arrived with the bad news, Jo and Mr Chief were amidst discussions of how much professional data recovery would cost. Mr Chief had it in his mind that it would cost upwards of $1000, so it wasn’t worth it. But another rather crazy idea had occurred to him, which Jo clung to. He suggested swapping the driver board from the dead hard drive with another of the same type. This would only fix the drive if the board was the problem, and would be extremely difficult with such a small drive. If it worked, you would’ve destroyed two hard drives, but saved your data. If it didn’t, you would’ve just destroyed two hard drives for nothing. And because both hard drives would be destroyed, Dell (who we buy all our laptops from with ProSupport coverage) wouldn’t cover the replacement of the drives. That means it would cost you at least $200 for two new drives. In the end, Mr Chief told Jo to get a quote from a professional data recovery place (we found one online who could send you a free quote) and see what kind of price they came back with. Jo’s experience was publicized by Mr Chief as a ever-timely reminder to all employees to be backing up things, and in more than one place. It got me thinking about, across all my devices, what data do I have to lose? When I went home that night, I rifled through my laptop hard drive, and found that there was next to nothing that I would be devastated about if I lost it. The reason for this being that everything important is stored on our new mirrored NAS. There are only three things that I haven’t backed up: programs I’ve installed, game save files and all the little bits of customization I’ve done to my Win7 setup. Most of the programs I probably could back up, and the save files I should (if I knew where to find them), but the customization is hard to back up. I just have to take some screenshots, and hope that sort of captures the most of it, so I can attempt to recreate it if I had to. Thinking about my other devices, the only thing I really need to back up is my mobile phone, but that’s pretty difficult, so I’m yet to do it. In the end, it turned out that the quote for data recovery came back as only being around $300, so much cheaper than originally thought, and well within Jo’s accepted price range. Despite that, she decided to go with some guy a friend of a friend of a friend knows who quoted between $300 and $600. We still got Dell to send out a new drive, so that she’s got a working laptop again (we just had to ghost [reimage] it ), but when they ask for the old drive back, we’ll have to ask for an invoice for the new one, and Jo will have to pay that too. All up, this unfortunate incident is going to cost her somewhere between $400 and $800. But that’s the price you pay for not backing up your data! So, what about you? Do you regularly back up? 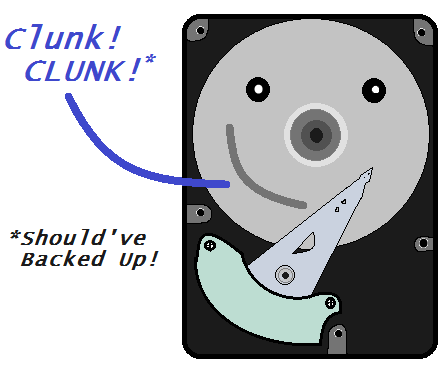 Have you ever considered what you would lose if your hard drive failed? What device could you least afford to lose? Have you learnt any useful lessons from Jo’s experience? As always, if you have something to say, like a reply or a suggested blog topic, feel free to tell me in the comments below, or on the Facebook fan page.